KIWI Magic (NZL - 20) lost the final of the LVC 1992 The challenger from New Zealand carried a tandem keel with a 9 ton lead bulb between. The challenger from New Zealand carried a tandem keel with a 9 ton lead bulb between. She had no rudder-blade but was steered by flaps on the keel. Yacht circles expected that NZL 20 will win the LVC because she was light, fast and handy with a professional crew. At the end she got troubles with an outrigger on top of her bow-sprit which was belayed with a line of her spinnaker. With this trick the boat could sail very fast gybes. 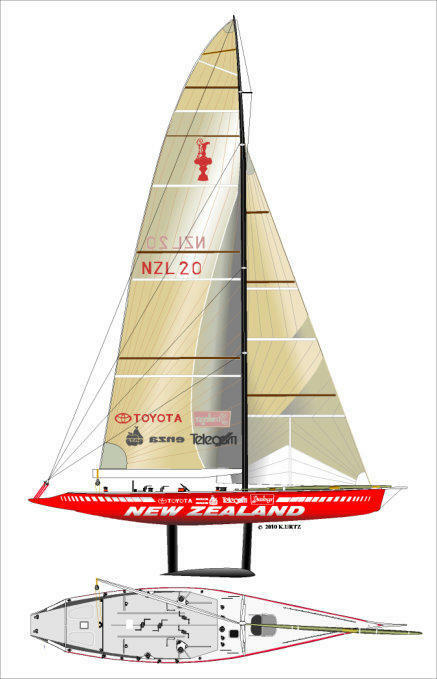 Despite a controversy if really the IYRR sailing rule was fringed, NZL 20 was fined and lost one won race in the final following a protest of ITA 25. At the end the crew was changed, conventional spinnaker manoeuvre could not be extensively trained any more and NZL 20 lost the final – close - but lost.